A team of researchers at The University of Manchester and Karlsruhe Institute of Technology have demonstrated a technique to chemically alter small regions of graphene with high precision, resulting in extreme miniaturization of biological and chemical sensors. The team led by Dr. Aravind Vijayaraghavan has published their findings in ACS Applied Materials & Interfaces. They report that it is possible to incorporate graphene with biological and chemical molecules and form patterns, which are 100s of nanometers in width. Graphene, the world’s first 2D material, is strong, flexible, and transparent, as well as the world’s most conductive material. All of the atoms in graphene are exposed to its environment, allowing it to detect alterations in its surroundings. Using technology that resembles writing with a fountain pen or a quill, the researchers were able to supply chemical droplets to the surface of graphene in very small volumes. In order to obtain such fine chemical patterns, the team used droplets of chemicals less than 100 attoliters (10-16 L) in volume; that is 1/10,000,000,000,000,000th of a liter. These methods are crucial to enabling graphene sensors which can be applied in real-world applications; graphene sensors fabricated in this manner may find use in blood tests, reducing the quantity of blood a patient has to give. Two types of ‘pens’ were used, one which is dipped into the reactive ‘ink’ like a quill to cover the nib, and the other where the ink is filled into a reservoir and flows through a channel in the nib, just like in a fountain pen. An array of such micro-pens is moved over the graphene surface to deliver the chemical droplets which react with the graphene. 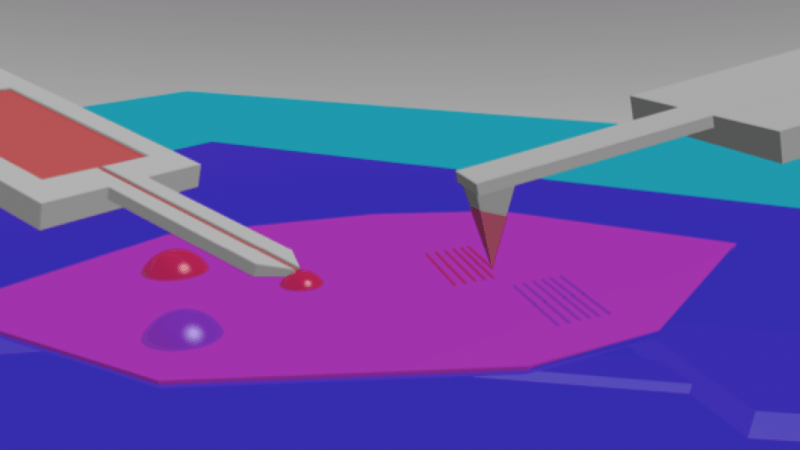 The first method is known as Dip-Pen Nanolithography (DPN) and the latter is known as Microchannel Cantilever Spotting (µCS).